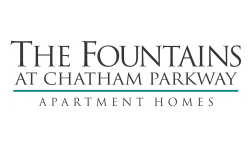 The Fountains at Chatham Parkway offers its residents the best of Savannah, Georgia. We invite you to check out our unparalleled amenities, including a resort style pool, a state-of-the-art fitness center, a leash-free dog park, a professional grade horseshoe pitching court, and more! Residents can choose from several studio, one, two or three bedroom floorplans, each equipped with upscale interior finishes. Our community is conveniently located just minutes from the best restaurants and entertainment venues in town. In addition, we are near Armstrong Atlantic State University, Hunter Army Airfield, and SCAD. If you are looking for southern charm combined with modern luxuries, Chatham Parkway is the perfect place for you!